More friends and a blog: Ahoy Teddy! Check out Teddy in his authentic seaman's cap! What better to keep his head warm on those cool nights sailing the Pacific Ocean. In his free time, Teddy is working on a striped sock that he feels really brings out the brown of his nose. Just a couple more inches to go before the heel flap - go Teddy go!! Well, it's not actually Teddy's cap. It's a birthday present for my husband and it fits his head a little better then it does Teddy's. Sort of. I made up the pattern myself and started decreasing when I was getting short of yarn. The decreases are a little funny because of the ribbing (which I have no idea how to decrease and made it up as I went along) and the length is a little funny because it's a little long to wear unfolded and a little short to fold up. Oh well, it's the love that went into it that really matters! teddy looks right smart, i must say! i can't remember if i told you, but on my blog i posted a scarfette that i made from some of the yarn i won from you a while back. the yarn is so great and people love it! I remember knitting your hubby a sweater when he was about ten years old. I misjudged the length and it sort of turned out to be a mini sweater. He wore that sweater without complaint. He even wore the Grandma K hoodie thing. I am sure he will adore his birthday gift. 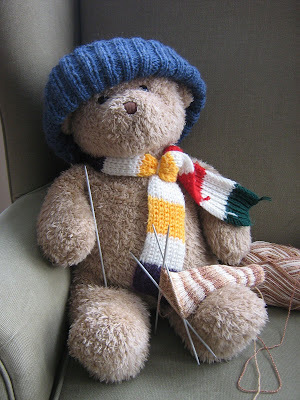 I don't think Teddy should be playing with those sharp knitting needles unsupervised! They look dangerous. The sweater could probably just be sprayed or put underneath a wet towel rather than completely soaked, but don't take my word for it (not being a wool user)! The idea of working with a soaking, heavy sweater was a bit much so I'll just wet the bottom!